Seine-Maritime pleases the eye with varied landscapes and satisfies curiosity with remarkable heritage sites. Explore a region with a promising and flavourful terroir, a mysterious history and heritage and a bucolic nature. The scenery of the Pays de Caux is unique. 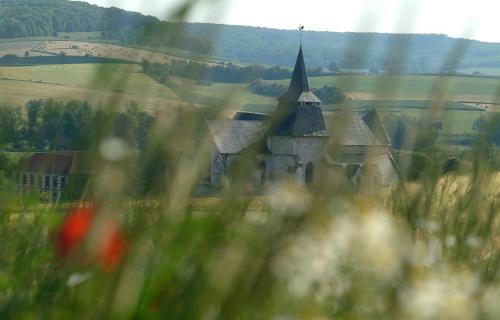 The countryside is divided by numerous rows of beech trees that shelter farm buildings: Clos Masures (traditional enclosed farmyards of the Pays de Caux). Each hamlet is a complex green warren dotted with half-timbered buildings, small manor houses or dovecotes. The Durdent and Saäne rivers have carved lush valleys. The Norman Pays de Bray forms a depression of fields and hedgerows surrounded by big forests. Eu, Eawy and Lyons have the most beautiful beech groves in France. Narrow, winding paths lined with side slopes planted with flowers and white hawthorn follow the bank of rivers or span rivers, thus offering amazing views over age-old churches, beautiful dovecotes, manor houses and chateaux. The region is brought to life thanks to charming towns like the spa town of Forges les Eaux and its casino, or Neufchâtel en Bray. The Bresle Valley is renowned for its glass industry, which is now essentially centred on the production of luxury glass bottles for perfumes.